Inherent within the scientific method are the processes of observation and documentation. These critical aspects allow scientists to record, review, dissect, and analyze their own, and other’s work. Without documentation, results cannot be verified, experiments cannot be reproduced, and proof cannot be established. 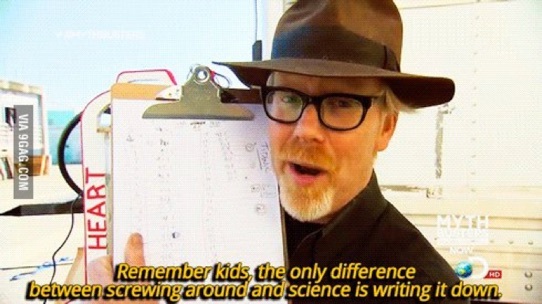 Simply finding an answer and publishing it is not science; as your math teachers always asked on exams; you must show your work. Forensic science is the application of the scientific method to matters of the law. In this regard, forensics provides documentation to not only satisfy the requirements of the scientific method, but the same documentation is also presented in legal matters, and stands as court records. Because of this unique aspect, forensic documentation is a double-edged sword. Scientific documentation should serve to document all aspects of the findings, both positive and negative. It’s just as important to record what did not work as what did. However, in forensics, documentation of problems, issues, and failures can be detrimental when such documentation ends up in court. From a legal standpoint, case documentation needs to be airtight. The last thing a prosecutor wants is a forensic report to open additional questions or present alternative conclusions to what is being presented in court. For this reason, forensic labs have often relegated case notes, bench notes, etc. as “work product” and therefore exempt from the legal discovery aspects (2). A formal report would be issued, summarizing the analytical work and findings, and this would stand as the official record of the case. This was sterile, reviewed, and final, making no mention of problems or issues that occurred in the testing. While viewed as ideal for presentation in court, these reports are far from standard scientific documentation. If forensics is going to be addressed as a serious applied science, then this documentation paradigm must be resolved. Unfortunately, most forensic laboratories are not in a position to address this issue due to influence from their parent agency, whether that is a law enforcement agency, a prosecutor’s office, or some other level of city, state, or federal oversight. Until forensic laboratories can show the benefits of open scientific documentation and allow the courts to weigh all aspects of such reporting, the laboratories will remain on the defensive, constantly having to refine, rework, and re-write reports that best serve the courts, and not the science. Forensic practitioners know that mistakes are happening, every day, in every forensic laboratory. Samples and instrumental runs fail, results are not concordant, corners can be cut, departures from protocols occur. If a forensic lab wants to be considered a scientific laboratory, then these issues need to be documented, disseminated, and presented in court. The Band-Aid solutions of hiding behind work-product rules and discovery obligations are beginning to be challenged in forensic casework (3), and the longer forensic labs wait to self-address and self-correct this issue, the more painful that Band-Aid will be when it rips off. 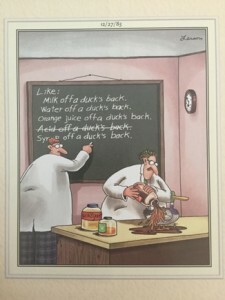 G. Larson (2007) The Complete Far Side Collections, FarWorks, Inc.